For the third consecutive year, the readers who live downtown in the Capitol Lakes Retirement Community were engaged in the Go Big Read program in a variety of ways. Three dozen men and women met to talk about Radioactive during one of three scheduled small group discussions. The film Silkwood was viewed and discussed one afternoon by a small group. 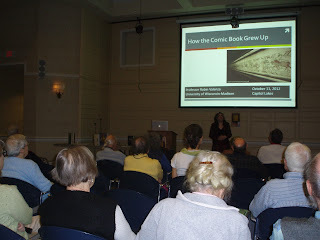 An organized group from Capitol Lakes attended Lauren Redniss' talk at Union South on October 15. 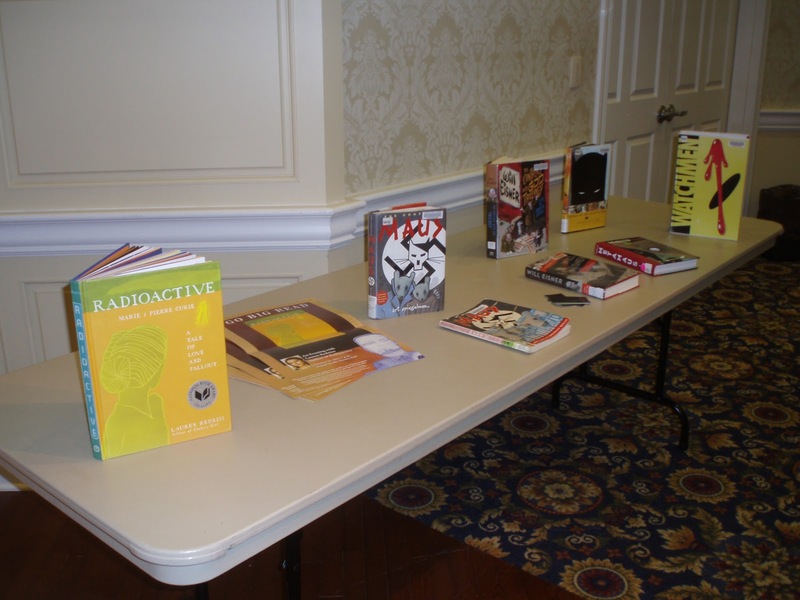 Capitol Lakes also provided a venue for two guest speakers from the faculty. People from the campus and the general public were welcome to attend these talks. On October 11, Robin Valenza (UW-Madison Assistant Professor in the English Department) provided a history of highly illustrated narratives in her lecture “How the Comic Book Grew Up.” Valenza discussed the evolution of comics into a respected literary form, especially with the publications of graphic literature such as Art Speigelman's Maus, Watchmen by Alan Moore and Dave Gibbons, the works of Will Eisner, and the Batman graphic novel, The Dark Knight Returns. Cathy Middlecamp (Associate Professor of Environmental Studies, Howe Bascom Professor of Integrated Liberal Studies and Nelson Institute for Environmental Studies faculty) spoke at Capitol Lakes on October 23. Her very informative lecture “Uranium and U” featured a wide range of opportunities for audience participation, as well as safe, hands-on examinations of several forms of radium. Middlecamp played an intriguing excerpt from a recorded interview with one of the surviving “radium girls” who had once painted clock faces using brushes dipped in radium. Middlecamp’s audience that day included a veteran whose military service had required him to be on a tug in the Pacific during the A-bomb tests. He affirmed Middlecamp’s assertions about the half-life of uranium. Ginny expressed appreciation for the support of Capitol Lakes Community Development Director Mary Hanson and the campus Go Big Read committee chair Sarah McDaniel (UW Libraries). According to Ginny, “The Capitol Lakes staff was behind it, and so were campus representatives who became involved. Due to our substantial experiences with The Immortal Life of Henrietta Lacks and Enrique’s Journey, early last summer people began to ask me about when we would discuss Radioactive. Midst all the concerts, lectures, art exhibits, films and other intellectual and aesthetic opportunities at Capitol Lakes each month, it’s no surprise to me that people already look forward to the next Go Big Read!" Still time to sign up for spring semester! La Loïe Fuller: Danse Radioactive? Happy Halloween from Marie and Pierre!